Biafra Nations Youth League, BNYL has dismissed the announcement by the Media and Publicity Secretary of the Nnamdi Kanu led Indigenous People of Biafra, IPOB, Emma Powerful revealing the kind of system of government that will suit an independent Biafran nation. 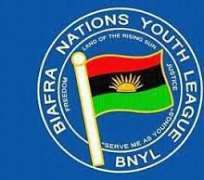 Faulting the comments, the National Leader of BNYL, Princewill Chimezie Richard cautioned IPOB against it's drastic moves that will place Biafra as an autocratic Nation. The group rejected the proposal adding that any such document will not be accepted as Biafran constitution. "No group should impose it's Organizational affairs on Biafra. You don't sit abroad to create constitutions, whoever is proposing a constitution should come home and summon those it concerned".
" Igalla, Idoma and middle belt remains our neighbouring tribes, the fact that they shares border with Enugu, Ebonyi and Cross River does not make them part of us, they can be tiny borrowed cultures but we won't welcome such idea. Even among the Eastern tribes, all have opinions and rights to decision. Our territorial integrity is far beyond groups pronouncements". It revealed the group's achievements in areas it classified as "strategic locations in Biafra".